Every so often, statements or public announcements land on the news about the risks of electro-magnetic radiation on human health. Conclusive studies have been harder to come by, though, so safety advocates caution that “it’s better to be safe than sorry” and product makers cater to this growing niche of worried consumers. Many appliances emit some amount radiation, such as microwave ovens and televisions, but one gadget in particular has been in the hot seat — mobile phones. Given how many of us use them (powered up and on our person all the time, not to mention held up at the head), this single device seems to be a lightning rod of concern in the medical and research communities. Now the International Agency for Research on Cancer (IARC), a specialized group within the World Health Organization (WHO), has come out with a disconcerting statement: Despite years of assuring users that detrimental health effects from cell phones have not been conclusively determined yet, WHO is now saying there could be a genuine risk of cancer there. In fact, after a team of 31 scientists from the U.S. and 13 other countries assessed peer-reviewed studies, they categorized mobile phone usage as carcinogenic hazards on par with lead, engine exhaust and chloroform. Predictably, none of this thrills the mobile tech community. John Walls, vice president of public affairs at CTIA – The Wireless Association, points out that the WHO decision is based on “limited evidence… IARC conducts numerous reviews and in the past has given the same score to, for example, pickled vegetables and coffee.” There is still no conclusive evidence that mobile phones cause cancer, says Walls, and other groups like the Federal Communications Commission (FCC) and the Food and Drug Administration (FDA) have reviewed the same data and came to different conclusions. Are you concerned about cell phone radiation? Or electromagnetic fields from other devices or appliances? For more facts, check out the bullet points below, along with the vid clips that follow. Cellular phones emit non-ionizing radiation akin to an extremely low-powered microwave. There’s a concern that these waves basically do the same thing to our brains that our microwaves do to our food — cook them. The European Environmental Agency believes mobile phones could be an enormous public health risk rivaling smoking, asbestos and leaded gas. The organization is leading a charge for more studies. A memo went out to employees at a leading cancer-research institute at the University of Pittsburgh, telling them to limit cell phone usage due to the potential risk of cancer. 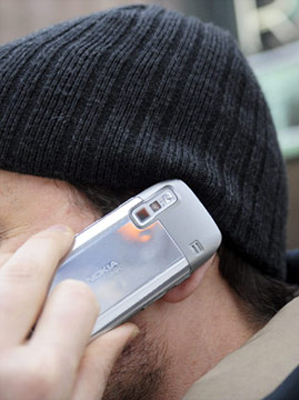 The largest international study on cell phones and cancer was released last year. It revealed that subjects who had used cell phones for a decade or more had twice the brain gliomas (tumors). When it comes to the effects of cell phones on children, no long-term studies exist. The theory is that children’s skulls and scalps are thinner, so radiation can penetrate further into the brain. And since young users are still growing and developing, the impact could be much greater. Two popular devices from Apple and BlackBerry both suggest safety protocols for their devices. For the iPhone 4, the safety manual says users should keep the handset at least 15mm (5/8 inch) away from the body for calls or during wireless cellular transmission. BlackBerry Bold users are urged to keep the smartphone at least 25 mm (0.98 inches) away.